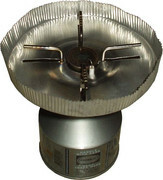 It looks like a "posh" version of the BRS-3000T titanium stove that was available on eBay for about a fiver last year; they're still around but for double that amount now. Weighing 25g, they're extremely powerful, and come in a little drawstring bag like yours. Great close-up photos, by the way. I picked up several of those a couple of years ago - there was a price war developing between several suppliers, I bought my 1st one at £2.99 (inc delivery) then when they dropped to £1.99 (inc delivery) I got a couple more, then when they dropped to £0.99 (inc delivery) I got a couple more - well you cannot let that go by can you !!. Mine weigh in at 45 grams, so presumably stainless steel rather than Titanium. But at 1.5 ounces I'm not worried. I have tested them and on 'full' power they are between 2.8Kw and 3.0Kw which is identical to the outputs claimed by all the quality brands. I have the Ti eBay version. It's good but it's not great for simmering food as it only heats a little patch on the bottom of the pot. Fine for heating water. All you need now is a windshield - I made one out of a couple of aluminium beer cans held together with paperclips! I have the Koro. Got it as a gift. I read your experience with it. Hoping mine works out ok.
Don't surround the stove too closely - it reflects the heat and causes the gas to expand and has been known to cause the cartridge to explode. I use a 'poundshop aluminium Turkey tray' cut into an oblong, formed into a 3/4 circle and stands a few inches away from the stove. Keep the wind off but allows the reflected heat to dissipate. In really cold weather the wind-break can be moved 'inwards' and the additional heat helps keep the gas flowing (as we all know, as gas is used the pressure reduces and the gas inside cools and we get 'ice' on the outside of the cartridge). The best way is to use a pie dish - keeps the wind off and removes all possibility of reflected heat. You know how they say every backpacking item should be dual-purpose? Well, the back of my rucksack propped on its edge does a reasonable job of keeping the wind off my stove. Providing it's not too close of course. Quite impressive. There I was thinking they were taken with an SLR on a tripod with a close-up lens, or maybe a top-end compact!